Memorials and Honoraria are monetary gifts made to St. Andrew’s Episcopal School to memorialize, thank or honor an individual or group. We encourage you to remember or honor the special individuals in your life through an honor or memorial donation. The most notable gifts are those made in honor of others, and we are grateful that you are considering St. Andrew’s Episcopal School as the recipient of your gift. Beneficiaries of honor/memorial donations receive a special letter acknowledging the donor’s gift in their honor or memory. Unless specified, these gifts are used in the current year’s operating budget. 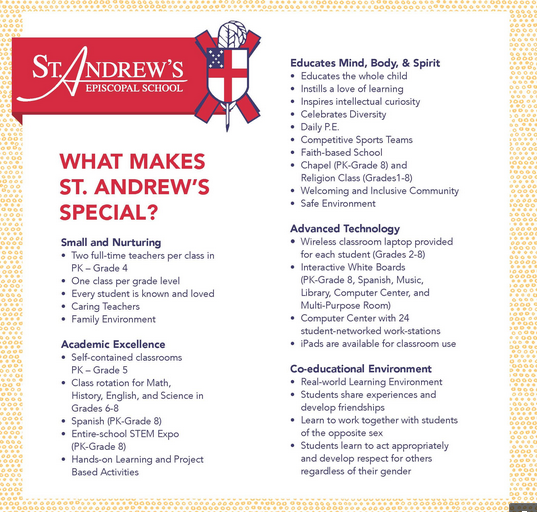 If you have questions about making an honor or memorial gift, please contact Dominique Chauvin, Director of Development at (504) 866-6552 or dchauvin@standrewsepiscopalschool.org.